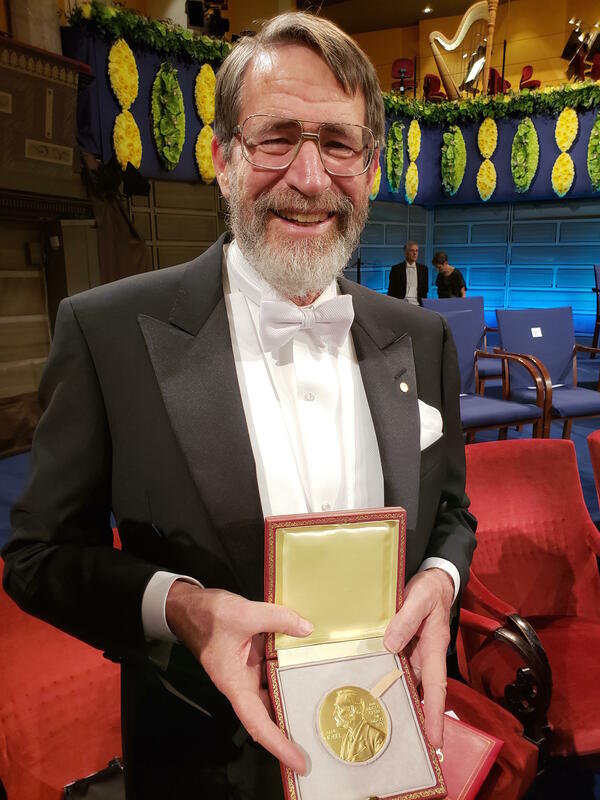 University of Missouri's George P. Smith, professor emeritus of biological sciences, with his Nobel medal. How does news from around the globe get delivered to you? On this week's special edition of Global Journalist, a team of Missouri School of Journalism reporters and professionals pull back the curtain on the high-tech process behind the recent live coverage from Stockholm, Sweden of MU Professor Emeritus George Smith's Nobel Prize in Chemistry. Student reporters Meg Cunningham and Savannah Rudicel, as well as KBIA's Nathan Lawrence and Ryan Famuliner, brought the story home for the mid-Missouri audience served by the Columbia Missourian KBIA 91.3 FM and KOMU-8 News.